We tasted only one pure Bonarda, the other was blended with Syrah. Bonarda? Yes, Bonarda; it hails from Italy, Piedmont to be specific, the home of Barolo, Barbaresco, and fantastic food. Generally the wines produced are light, fruity and often used in blends. Very little Bonarda is planted in Italy anymore - there are a few clones to add to the confusion - but Malbec only recently surpassed Bonarda as the most widely planted grape in Argentina. So why don't we see more of them? Beyond the traditional use for blends, Bonarda produces fairly nondescript wines. Only older vines produce enough concentration for intriguing wines. However, Bonarda possesses a meaty quality in these examples that proves too much for many people. Sometimes the meatiness can edge over into wild animal and bloody aromas (like a butcher shop, not roadkill). Much like Pinotage (another day, another story) Bonarda has a bad reputation for many wine drinkers; while I will admit there are poor examples of both grapes in the market, I think the reputation is much worse than reality. In South Africa, home of Pinotage, they eat a lot of meat, sometimes fairly exotic, that gets braaied (Afrikaans for barbequed). Pinotage pairs wonderfully with those meals. The same is true of Argentina. They grill a lot of steak and Bonarda matches up well. I quite like Pinotage and Bonarda, and although I realize that leaves me in the minority, I truly believe that more wineries are learning how to handle the varieties and that quality will continue to improve. Try some of my recommendations, if you don't like them, don't bother with the variety anymore. La Linda Bonarda 2006 - Maipu, in Mendoza, is the source for this wine, more specifically, a vineyard located at 2,560 feet elevation. It spent 6 months in American oak, some clearly new. Other tasters had moderate reactions to this wine, 'unexciting', a smiley face, while one simply wrote 'who cares' next to the Bonarda based wines and moved to Cabernet. I loved it! I found this example to be juicy, meaty (as expected) and gulpable. The vines are about 30 years old and it makes a difference. More depth, more complexity, more richness, all shine through. The wine is not huge by any means, but the distinct meaty quality here lends itself to grilled red meat, especially lamb, and wild game sausages. It will work beautifully with harder cheeses too, particularly aged Goudas. 2nd day - Still nice, plummy and juicy, with a bit of greenness showing on the nose. The acidity stayed bright and the meat note carried through as well, a la Pinotage but prettier than those can be. 3rd day - Meaty and still a little 'bloody', although the finish faded a bit today, the wine remains eminently drinkable. I like this wine. Importer - Gaucho Imports. $9-$11. Benegas Don Tiburcio Blend 2003 - This is a classic example of the value offered in Argentina. Although I was not crazy about the wine, a similar blend made with the same level of care by consultant Michel Rolland nearly anywhere else in the world would sell for at least two to three times the price. Malbec, Cabernet Sauvignon, Cabernet Franc, and Merlot make up the blend that was aged in French oak for 18 months. It is one of Benegas' flagship wines, named after the patriarch of the estate. Smoky aromas, no doubt from the oak, shine on the nose and the wine is pleasantly big in the mouth if a tad too chewy on the back end - perhaps too much extracted wood tannin? I liked it well enough, but overall found the dryness on the back end to be too much for me. We were eating a variety of cheeses and cured meats, perhaps a big juicy steak would mitigate those tannins. 2nd day - Sweet oak on the nose, and now the palate too, better today, more accessible, but still a touch gritty on the finish. The palate feel is all old world Bordeaux, with bigger, rounder fruit than they could ever hope to achieve. 3rd day - As is often the case with Michel Rolland's wines, this one died between day two and today. He extracts fruit and manipulates juice to achieve a certain style - big, intense and full of flashy dark fruit and oak. However, a price is paid, the wine loses some of its liveliness. I'll put together a post to discuss this further somewhere down the road. Overall, if you love Bordeaux for a better price, buy this, decant it and serve it with red meat; you will likely be quite pleased. Importer - Pinnacle International. $14-$16. I'll touch on a few Cabernet Sauvignons here to get us started since we tasted ten of them and it will make the next post a more manageable size. There will be an introduction to Cabernet in Argentina to start the next edition. Next - More Cabernet and some thoughts about this variety in Argentina. I have survived another Mardi Gras. My voice is shot, but you can't tell that here. We'll stick with whites here for one more post (kind of nice for me, as it's supposed to be near 80 degrees today). So, on to some Chardonnay. NQN Picada 15 White Blend 2007 - This wine hails from Patagonia, south of Mendoza, specifically Nequen which is cold, with near constant winds and little risk of disease or pests. It is produced at a cutting edge winery blazing a trail in the region. Okay, not technically a Chardonnay since it is also blended with Sauvignon Blanc and 5% Pinot Noir(!?!). We were all fascinated with this wine. It came in a clear glass bottle and had a bit of a funky deep yellow color, perhaps due to the Pinot Noir. Pear and citrus dominated the nose with even a hint of red fruits, or am I just expecting them since it has Pinot Noir in it? Bright, fresh acid, fun wine! It is exactly the kind of wine that would languish on most retail shelves - unusual color, weird blend, new region. However, the people who tried it would be rewarded as the price is fantastic. It would make a wonderful addition to most restaurant by the glass lists. It is what I call a geek wine, but it has wider appeal if you can get it in their glass. 2nd day - The nose has faded, but the palate is still good. It held up fine. 3rd day - More subtle, subdued now, but also more of the Pinot Noir is showing on nose and palate. Imported by Pinnacle International. $10-$12. Finca La Linda Chardonnay 2007 - unoaked - The grapes come from Lujan de Cuyo immediately south of the city of Mendoza, but in the northern portion of the appellation Mendoza. The vineyards are located over 3,000 feet above sea level despite being located in a picturesque valley. The wine features pear and melon on the nose, with crisp acid and good weight - especially for unoaked Chardonnay - but it may be too crisp for most dedicated Chardonnay drinkers. However, there is leaner, less exuberant fruit, and a talcy dryness on the finish that will help it to pair well with lighter seafood. Overall the wine is solid, but missable, although I found it got better with time open. 2nd day - More roundness, riper, fuller in the mouth, but still crisp. 3rd day - I like it even more, better balance and showing more Chardonnay character. Importer - Gaucho Imports. $10-$12 (although I did see an $18 price listed). Alamos Chardonnay 2007 - From the Catena family that also produces Catena Zapata, this Chardonnay undergoes, "moderate oak aging in French oak." The fruit is all Mendoza with a concentration from Tupungato. This is the most western region, i.e. closest to the Andes, in the appellation of Mendoza and lies south of Lujan de Cuyo and Maipu. Vanilla appears immediately in the aromas, courtesy of the French oak. The wine is decent, classic, slightly oaky Chardonnay. The only reason to move to this from another style you may like is price, a desired change of pace, or if you want to offer something from Argentina. There is nothing unique offered by this bottling. Although I find it generic, it is well made and that might push it up to a quality level not often seen at this price point. 2nd day -No change. Importer - Billington Distributors. $10-$12. Our other moderately oaked style was, unfortunately, corked. Next we get into the reds - see you in a day or two. Let's begin with the signature white grape of Argentina, Torrontes. Widely believed to have originated in Spain, recent DNA tests show this grape to be a hybrid of Muscat of Alexandria and Criolla Chica (what a great name for a grape!). Muscat, best known for making dessert wines, is wildly aromatic. Torrontes possesses similar characteristics, altered but undimmed by the merger with the lesser Criolla Chica. People that try the wine for the first time react strongly to the nose, sometimes assuming the wine will be sweet. Most are pleasantly surprised by the clean, occasionally racy, mid-palate and the juicy, but dry, finish. It is both a red wine drinkers' white wine and a perfect back porch sipper for white wine fans, in the same way as Viognier. Texture plays a part in appealing to red wine fans and the openly fruity quality works for lots of people who prefer white wines. Torrontes offers great drinkability, perfect for warm summer days, but it also pairs well with all manner of Asian food, shellfish, salsas, and goat cheeses. I have tasted a few Torrontes that suffer from the somewhat sappy, dull palate that plagues many Viogniers, but nearly all are tasty, fresh, and fun to drink. Try one...think Viognier meets Sauvignon Blanc; the exotic fruit of Viognier is tamed and features more of the crisp, citrus end of the spectrum while the acidity level is more pronounced, but not as intense as some Sauvignon Blancs can be. A note before beginning, although a lot of wines were tasted, this is by no means a complete inventory of readily available options from Argentina. The goal was to taste through the Pinnacle International portfolio and compare it to the competition. I was hoping to go to work for them and wanted to be sure the wines held their own. I did not include many other excellent wines including an impressive array from Vine Connections as I knew the wines well already. Perhaps I'll feature some of their wines later. No oak was used to make any of the wines below. I also made notes the second day, the wine was preserved simply by replacing the cork or screwcap. El Cipres 2007 - From the Correas family of Mendoza, the wine has a deep, sweet nose. (Note, when I use the word sweet here, it indicates sweet fruit, not sugar content). The palate is lively, but with a bass note as well. The sweet notes do not carry through to the finish, a very intense, tingly acidity dominates there. While it may be too persistent to be a crowd-pleasing style, the wine is mouthwatering and lasts for well over a minute. 2nd day - The wine is more harmonious, softer, better balanced and showing some peach notes. I like it better today. Importer - Pinnacle International - $8-$10. Urban Uco 2007 - A joint project between the Fournier family of Ribera del Duero in Spain and Jorge Ordonez, a leader in Spanish imports to America. This comes from Salta, more specifically Cafayate (kaf-a-jat-ay), well north of Mendoza. Salta is widely considered to be the area for Torrontes production with some of the highest altitude vineyards on the planet (over 5,500 feet, some over 6,000 feet). Better balanced than the above, on the nose, palate, all over. People will dig this wine. Juicier than El Cipres, easier to drink, but still fresh with some tingly acid. Overall, the juicier fruit make this wine a crowd pleaser. 2nd day - Still lovely, (expletive) it's even gorgeous. This may be the best Torrontes I've ever had. By the way, this wine was still delicious on the 3rd day. Importer - Jorge Ordonez - $7-$9. Alamos 2007 - Also from Salta, this wine is produced by the famous Catena Zapata winery. Almost a Sauvignon Blanc nose, maybe a bit piney(?) - barely. The wine is subtle, dry, but eminently drinkable. I wondered whether any oak had been used here. Good, not great, not much of the signature juicy Torrontes fruit present. 2nd day - nearly dead, mute and lacking a finish. Importer - Billington Distributors - $8-$10. La Linda 2007 - Also from Salta, and offers spicy acid and floral aromas but some deep fruit notes as well. Overall, it is solid and correct. Well made and assertive, it bears similarity to El Cipres but offered better balance right out of the gate. 2nd day - Nose is much more subtle, the finish remains solid and still lively with a clean, racy style. A safe, if less than riveting option in the world of Torrontes. Importer - Gaucho Imports - $9-$11. Next post will be Chardonnay and a very unusual but very intriguing blend, then on to reds. In anticipation of a new job, I hosted a huge tasting of Argentine wines recently. It was so huge it took me nearly an hour and a half to open all the bottles...let that sink in a minute. Nearly an hour and a half opening wines. No fancy foil cutting; tear it off and insert corkscrew. A quick wag of the finger to Argentine producers - more screwcaps! That would have sped things up considerably. On the plus side, only one wine was corked. Because of the size of the tasting, there will be multiple entries here to cover all the wines and it seems appropriate to set the scene. Despite the relatively recent explosion of Malbec awareness, and the resulting impression that Argentina just started making wine, grapes have been planted since the mid-1500's. However, early viticulture focused mostly on Criolla (kree-oya) which is known as Pais (pie-ece) in Chile and the Mission grape in California, where it was planted mostly to make sacramental wine. After Argentina declared independence from Spain in 1816 many Italians and Germans arrived and brought new cultivars. Miguel Pouget began a School of Agriculture in Mendoza in 1853 and brought French varieties to Argentina, including, one would assume, Malbec; the grape enjoyed perhaps its height of popularity in France around that time. So why are we only hearing about Argentina in recent years? Political uncertainty and economic turmoil prevented sufficient focus on producing quality wines. As recently as the 1950's the government offered tax incentives to replace older vineyards with new, high yielding plantings. During the 1980's outrageous inflation caused Argentina to place price controls on wine which actually provided a disincentive to focus on quality. This unfortunate episode in Argentina's vinous history resulted in the uprooting of approximately 250,000 acres of vines. The political shift to democracy in the 1990's and an economy based on the free market, brought global investment which subsequently attracted attention, focus and upgrades in winery technology resulting in far superior wines across the board. Suddenly, a large array of solid wines at value prices became available. Continuing economic troubles help maintain a favorable (for the U.S.) dollar to peso ratio and help to fuel the current frenzy over Argentine wines. Mendoza remains the best known appellation and the assumed point of origin for nearly all Argentine wine. It lies east of Santiago, Chile with the mighty Andes Mountains between them. Buenos Aires sits nearly on the eastern border of Argentina while Mendoza nestles on the west in the foothills of the Andes. A note here about foothills. Springing to my mind are gently sloping hills, easily hiked and offering an improved, but not awe-inspiring view. The Mendoza 'foothill' plantings average about 3,000 feet above sea level, and climb to well over 4,000. Everything is relative, those qualify as foothills when their mountain range boasts a peak reaching nearly 23,000 feet. The altitude creates a large diurnal effect (change in temperature through the day), maintaining acidity and creating long growing seasons, which bring depth and complexity to the wines. Little rain falls and irrigation is essential. Snow from the Andes provides much of the water needed. Differences in terroir influenced by altitude will eventually create more appellations to further clarify the style of wine produced. Considering the size of Mendoza, this emerging edification is imperative. 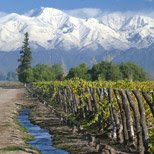 Over 350,000 acres of vines are planted in Mendoza (winesofargentina.com). That number exceeds total plantings in Bordeaux by almost 50,000 (newbordeaux.com) and is more than eight times the land devoted to grape vines in Napa Valley (wikipedia.com). Stay tuned for notes from the tasting. I promise to make note of smaller regions as those wines are discussed to help fine tune knowledge about Argentina. As Valentine's Day approaches and this giant sucking sound that passes for our economy these days drones on, I thought it appropriate to mention some values on the sparkling wine front. No true Champagne will appear here as there are no values in that region, at least not according to my wallet. If you can afford, and want to purchase, Champagne, by all means do so. There will be lots of other articles written about them. Send me a check to buy five or six bottles of Champagne and I will happily, and I do mean happily, review them here. The following bubblies offer quality beyond their price and are not exactly household names so your Valentine won't have to know you acted in a responsible fiscal manner when it comes to matters of love. If you are spending the evening alone, get some sushi, Epoisses cheese, mousse pate, or even fried chicken and enjoy some sparkling wine while proudly knowing you have not blown the budget for the week. Louis Bouillot Rose Cremant de Bourgogne - A pink wine is wonderfully evocative of the day itself and this is a rare,well-made example for less than $20. Made from 100% Pinot Noir with the color coming from short skin contact. this wine offers a delicate, but lovely salmon hue - slightly beyond pink. Rose petal and a slight hint of Pinot Noir earthiness mingle with strawberry on the nose and palate. The entry is round and juicy, while the finish is dry. There is a hint of the chalky dryness from the limestone soil but the juiciness persists on the finish as well. Imported by Boisset Family Estates, $13-$15. Gruet Blanc de Noirs - This French family searched for years to locate a suitable site to best recreate the terroir of their native Champagne. That region? New Mexico, outside of Albuquerque. They mitigated the heat by planting at 4,300 feet. The blend here is 75% Pinot Noir and 25% Chardonnay. The wine sometimes has just the barest hint of pink hue to it, but the Pinot Noir shines through on the nose and palate. A slight earth tone with bright berries on the entry, and the finish, speaks of it's mostly red grape blend. There is a richness and broadness that make this an excellent wine with many foods. Fish, even tuna and salmon, chicken, pork, cream sauces, and all manner of cheeses work beautifully. They also make a straight Brut with the exact opposite blend that is pure and racy. This works better with lighter fish and shellfish, think raw oysters, but the Blanc de Noirs is more hedonistic. $13-$15. Marques de Gelida Cava 2004 - Yes, Cava. This is one of the few I can recommend. Most Cavas have a metallic flavor, to my palate, and I can find that inelegant flavor for much less money should I desire it. Too many of these Spanish sparklers are not produced by the traditional method of making sparkling wine, secondary fermentation (producing the bubbles) done in the bottle. Carbonation is added by some producers in tank by pumping in CO2 which leads to much larger bubbles (sometimes called toad's eyes) which can be harsh and aggressive on the palate. Enough about what this wine is not...what is it all about? The grapes are traditional, Macabeo, Xarel-Lo and Parellada (yes, it's okay you don't know any of them) and some Chardonnay, produced in the traditional method. The aroma features crisp citrus and a hint of nuttiness. There is a zippy freshness about it and just a hint of creaminess on the palate. Admittedly, there is also a touch of inelegance, but the depth and character outweigh this for me, especially at this price. The package is fantastic and makes quite a statement...baby Veuv e anyone? I recently tasted two wines that had nothing particularly compelling about either, but no reason to pass and go look for a beer, or (gasp) water. They are indicative of the new world style that has made buying wine easier and duller at the same time. Value wines from all over the world now can be purchased with near impunity. It is extremely rare to find what I like to refer to as 'commercially unacceptable' wine on the shelves of reputable retailers. However, those wines almost never take us anywhere. Perhaps that's too much to ask of a value priced wine these days, but it never results in me racing out to buy more bottles. Ravenswood Shiraz 2006 - This wine used to come form Australia and had Kangaroos where the Ravens are in the iconic logo. This vintage is California fruit. Is this a permanent change? Are they bottling two now? Did they think no one would notice? Fairview Goats do Roam 2006 - This wine brought Charles Back untold publicity after the French INAO (Institue National des Appellations de Origine) sued him to prevent his usage of a clear reference to the famed Cotes du Rhone appellation. The blend here is half Shiraz, 20 percent Pinotage and small amounts of Cinsault, Mourvedre, Grenache, and Carignane. A similar blend to classic Cotes du Rhone, with the addition of the uniquely South African Pinotage grape. More red fruits are featured here with smoke on the nose and hints of pepper on the back end. The only aspect of the wine that offers any sort of intrigue at all is the palate, where the Pinotage lends a bit of its inherent meaty quality; not enough to make it truly unique, but enough to set it apart from many other wines in the same price range. You could do a lot worse. $8-$10.